I believe in holistic, hands on learning; that a person can learn something by doing it for themselves, and when they are able to do that they ‘own’ that information and it is theirs to work with, retain and expand upon. When I realized that Montessori understood this in 1907, I knew that the Montessori method was for me. I graduated with an Association Montessori Internationale 3-6 diploma and a Master of Education degree. After my training in Portland, Oregon, USA I returned to the far north of California where I worked at two schools over three years. 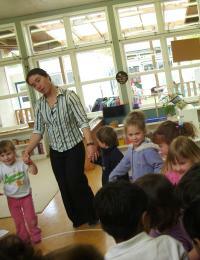 I then was offered a job a Wa Ora Montessori school in Wellington, New Zealand and moved there for a wonderful few years. The call of family made my husband and I return to the USA in 2008 and I now teach at a Montessori school in Bozeman, Montana, USA. What I love about being a Montessori teacher is the freedom and ability to observe and meet the needs of the individual children. I love the connection to the children’s families that working with young children allows. I love the wonder of discovery that the children show as they explore the Montessori environment that I prepared. I love the genius of the Montessori materials and pedagogy and the challenge of deepening my understanding to put the ideas to practice. Montessori is a deeply fulfilling career, one where you are challenged each day with the mysteries of childhood and self reflection. I have found working with children to be at the heart of the community and recommend the level of community connection that it demands. I would advise that you pursue a training institute that will give you the depth and breadth of the philosophy and ideally hands on training ; you will need to ‘own’ the information and only hands on learning allows for that. I would like to develop a deeper and deeper understanding of our work as Montessorians and to assist in promoting Montessori education to the wider public.